is for sub-acute and chronic inflammation and conditions of weakness. It acts as an immune modulator and increases the elimination process. The immunobiological preparations contain diverse fractions of various bacterial species, such as cellular extracts and cell wall fragments of polysaccharides in homeopathic potencies. Only especially suitable strains that were cultivated under specific conditions (note strain numbers) are used; their effectiveness has been proven by decades of application. They are able to regulate the course of a physical immune reaction and to raise the immune system’s capacity for response through their nonspecific stimulation. This is achieved by influencing diverse sub-populations of lymphoid and phagocytizing cells which take part in the immune functions. For instance, they indirectly take part in the structuring of humoral antibodies. Please Consult Dr. Hale, AP for more information on how Isopathic Remedies Immunotherapy may be of benefit for you. 2. Bacillus Species In folk medicine, tea decoctions using hay, excrement from cows, or peat moss have long been used, without any knowledge of their containing Bacillus subtilis as active agent. Farmers in many countries utilized hay infusions for curing intestinal diseases in cattle. As early as 1887, Metchnikoff described the growth-inhibiting effect of aerobic soil bacteria, particularly of Bacillus subtilis, against pathogens such as Streptococci, Staphylococci, Salmonella and Mycobacterium tuberculosis. Works by Ramon and Richou, as well as Jansen and Hirschmann in 1943/44 showed the antitoxic and antibiotic properties of the pathogen, which was generally referred to as “Hay bacillus”. However, the first reports about the oral, subcutaneous and intravenous application of Bacillus subtilis strains came from the former SANUM company in the years 1938/39 with outstanding therapeutic results. Particularly, its effectiveness with certain pseudotubercular forms was discovered at that time. The general stimulating effect on the nonspecific defensive capacity of the human organism already showed up in these beginnings of Subtilis Therapy. The name UTILIN® has been used under trade mark protection for this new, special remedy since 1939. In later years, additional Bacillus strains that are closely related to Bacillus subtilis found their entry into the therapy under the product names of LATENSIN® and RECARCIN®. Preparations with Bacillus species have manifold immunostimulating effects. Clinical observations yielded good success in recurring diseases of the urinary tract and the respiratory organs, in patients with defective immune situations, in food allergies, as well as other chronic diseases that were brought about by a reduced immune status (J. Hartmann, Therapeutikon 4, 1990). Isopathic Remedies are based on the Pleomorphistic school of thought, which was researched in great detail by Prof. Dr. Günther Enderlein (The Father of Darkfield Microscopy) and also described by others after him. The theory of Pleomorphism, which states that every human being and animal are bound to Nature in a most intensive fashion by their rhythmic nature and reactions, and are subject to con­stant change (pleo = diverse, varied; morph = -shaped). I s o p a t h y, on the other hand, directly addresses microbial pathogens or their toxins that cause damage to the body and cause illnesses. 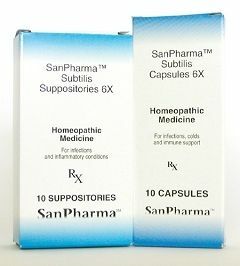 Isopathic-homeopathic remedies are homeopathically diluted and potentized. It is important to emphasize that these medications do not contain the actual active forms of the microbes, but stimulate the body to initiate a response to address pathogens and their toxins (2) present in the body that have been acquired through infection or heredity. T h e body is then able to address the underlying acute or chronic infection, or infestation, that it was not able to eliminate prior to treatment with the isopathichomeopathic remedy. Address nutritional deficiencies and aid in healing process. Act on cellular level as an active catalytic form. Eliminate bacterial toxins/proteins released from previous infections and CWD (Cell Wall Deficient) organisms.